Sigma Delta Tau Celebrates Five Years of Serving Children and Families! 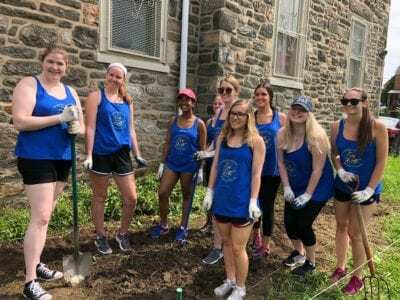 Sisters participating in the 2018 Alternative Summer Break program in Philadelphia. Alternative Spring/Summer Break (ASB) is a six-day, five-night service immersion trip. This experience is designed to be a hands-on opportunity for sisters to learn more about themselves, others, and the world around them. Sisters will also participate in nightly group discussion and reflection activities. Each trip usually accommodates up to 8 participants per session. These sisters will be selected from various chapters across the country. CASA’s mission is to raise our voices against violence through advocacy, empowerment and social change. CASA’s vision is a community without domestic violence so that home is a safe place. Sigma Delta Tau sisters will be able to learn about CASA’s prevention programs and residential advocacy services, including working with their Shelter which supports women and children. SDT is excited to work with CASA because the work they do empowers women and their shelter is a site for one of JWI’s Library Initiative program. Sisters on the ASB trip will explore ways our sisters can empower women through service and get more involved with JWI nationally and back in their community. Northern Children’s Services supports the healthy development of children, while stabilizing their families to build stronger communities. Sigma Delta Tau sisters will be able to learn about Northern Children Services’s behavioral health, child welfare and residential programs, including working with their center which supports women and children. SDT is excited to work with Northern Children Services for the second year because the work they do helps prevent child abuse and neglect in many ways, and their center offers a variety of services to help children, families and the community. Sisters on the ASB trip will explore ways our sisters can empower women and children through service and get more involved with Prevent Child Abuse America (PCAA) nationally and back in their community. Engage in meaningful service to create positive change related to Sigma Delta Tau’s Philanthropic efforts in Child Advocacy. Learn about and reflect upon the complexity and interconnectedness of social issues. Improve your leadership, critical thinking, and dialogue skills in dynamic real world scenarios. Discuss ideas for continuing community engagement work upon your return to your chapter and campus. Build meaningful relationships with a new community of civic-minded sisters within Sigma Delta Tau. Travel to and learn about new communities, and explore new perspectives. Develop an increased capacity to work across differences to build relationships. Gain valuable experience for your resume. Experience a program that could influence your future career path and lifestyle. Learn about yourself, challenge yourself, and have fun! Participate in ALL pre- and post-trip virtual meetings. Be open to processing the ASB experience individually and as a group through organized reflection, journaling, and other activities that suit your reflection preferences. Serve as a positive role model, representative, and ambassador of Sigma Delta Tau. Be respectful of diverse communities, cultural norms and values that you may experience in the location you are serving and/or with the sisters on the ASB trip. Commit to being an active contributor to your team and show respect for fellow sisters, community partners, and populations with whom you are completing service. Be organized, self-motivated, adaptable, and flexible. Refrain from the use or possession of alcohol or any controlled substance/drugs for the duration of the experience. There is a program fee of $400 per person. A $75 deposit is needed to secure your spot on the trip immediately following your acceptance into the program. Must pay in full $400 ($325 after deposit) by January 31, 2019. Upon acceptance, you will attend two virtual orientations to discuss the trip in greater detail, complete paperwork, review guidelines, and get to know other participants! These orientations will be scheduled based on participant availability. Thank you for your interest in SDT’s ASB Service Trip. Applications for the SPRING trip are closed for now. If you’re interested in the SUMMER trip, please click below.